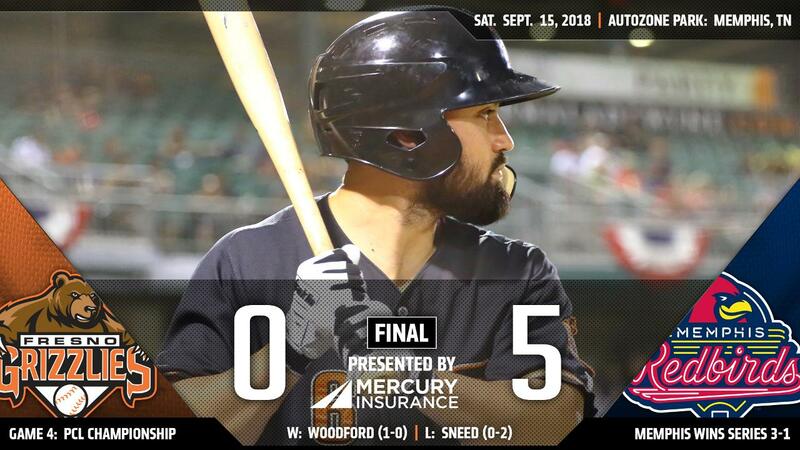 The Memphis Redbirds (American Conference Champions) blanked the Fresno Grizzlies (Pacific Conference Champions) 5-0 in Game 4 of the PCL Championship Series Saturday night from AutoZone Park. With the win, the Redbirds clinched their second straight PCL title. They will head to Columbus, Ohio to face the Durham Bulls for the Triple-A crown. Both teams met in 2017 with Durham coming out victorious. Memphis lunged out to a 3-0 advantage in the bottom of the first. After back-to-back singles, Randy Arozarena (2-for-4) jumped on a pitch and sent it over the wall in left field. The three-run shot was his first homer of the series. Fresno starter Cy Sneed (0-2) lasted three innings, taking the loss. He allowed three runs (earned) on seven hits and two strikeouts. His 10 victories during the regular season were the most since 2016 when Brady Rodgers and Cesar Valdez had 12 wins each. On the other side, Redbirds starter Jake Woodford (1-0, win) dominated for seven and one-third scoreless frames. He scattered three hits and one walk while fanning six. Grizzlies reliever Akeem Bostick hurled four shutout innings, allowing only three hits. Over three playoff outings, Bostick punched out four and didn't allow a run in six frames of work. In the bottom of the eighth, Arozarena expanded the lead to 5-0 when he jolted a two-run blast to left field. It was his second big fly of the contest. Up by five, Giovanny Gallegos received a popup to third to secure the championship. He went one and two-thirds innings of one-hit ball. Fresno concludes 2018 with an 82-57 regular season record (4-5 playoffs). The squad finished 25 games over .500, the second time in franchise history (2015) and had the best winning percentage all-time (.590). The Grizzlies pitching staff also ended with 1,330 strikeouts, breaking both the franchise and PCL mark held by the 2017 Oklahoma City Dodgers (1,277).